All Janeites, I’m sure, wonder what their favourite author looked like. We have a strong idea of how George Eliot, Charles Dickens and Thomas Hardy looked, based on the professional portraits and photographs that we have seen; however, to our knowledge, Jane Austen never had a formal portrait made. No doubt, this is because she never became a notable author in her lifetime and her family perhaps never expected her to rise to great fame. The most reliable source that we are all familiar with, is the tiny pencil and watercolour sketch (above) made by Cassandra Austen, Jane’s sister, when Jane was around 35 years old. The portrait can be seen in Room 18 of the Romantics Gallery, in London’s National Portrait Gallery. The portrait above is, perhaps, the most common one by which Jane is known all across the world. The engraving was commissioned by Jane’s nephew, James Edward Austen-Leigh, for his book, “A Memoir of Jane Austen”, in 1870. The Victorian engraving by Lizars is based on Cassandra’s sketch, but it shows a Jane with slightly different features. In the second version, Jane even wears a wedding ring! One does wonder what Austen-Leigh thought about the portrait, having met Jane when he was a child. From this portrait we can only gather that Jane probably had a good posture and wore pastel-coloured gowns with bonnets, which were in fashion in her time. 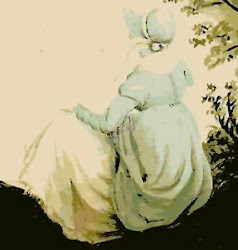 There is a silhouette, which is often used to portray Jane Austen (above). It was found pasted in a volume of the second edition of Mansfield Park in 1944 and had the handwritten inscription ‘L’aimable Jane’. Now why would someone put a silhoutte of someone called Jane inside a Jane Austen novel, if it wasn’t of Jane Austen herself? Think what you will, I find this inadequate evidence and would be very cautious of using the silhouette as a true portrait of Jane Austen. The silhouette does not correspond to my idea of Jane with a rather long and pointed nose, instead of the slightly upward turning, straight one portrayed here. The above picture was painted by Reverend James Daniel Clarke, the Prince Regent’s librarian, after Jane visited him in Carlton House, the Prince’s residence, in 1815. The painting was found in Clarke’s friendship book and shows Jane dressed in her finest for the visit. The picture has not been authenticated, but researchers have studied the portrait and found the features matching those in Cassandra’s portrait. The above portrait, known as the Rice portrait, was passed down generations of the Rice family, descendants of Edward Austen Leigh. Family tradition has it that this is a portrait of Jane Austen, but it is not known if it is of THE Jane Austen. I feel this is unlikely, as Jane will not have had a large, formal portrait made of her in her childhood, as there were none of Cassandra or her brothers when they were young. 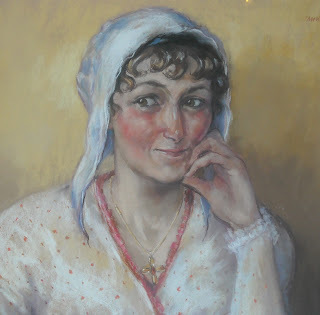 In conclusion, we can only be certain that the two portraits painted by Cassandra Austen can be considered authentic images of Jane Austen, but they do not show Jane as the attractive woman that she was described by some to be. We need to rely on descriptions given by people who knew Jane Austen. According to Austen-Leigh, "in person she was very attractive; her figure was rather tall and slender, her step light and firm, and her whole appearance expressive of health and animation. In complexion she was a clear brunette with a rich colour; she had full round cheeks, with mouth and nose small and well-formed, bright hazel eyes, and brown hair forming natural curls close round her face." What we do know for sure is that Jane Austen was slim, and tall by the standards of her time, with a good posture and a light step. She had a brownish complexion and good skin, and dark brown hair, which curled around her face. Her face was round, and she had full cheeks. She had hazel eyes and looking at family features, probably a long, pointed nose and a small, straight mouth. From her late twenties onwards, she always wore a cap. Did she look like the lady painted by forensic artist, Melissa Dring, for the Jane Austen Centre (above), who looked at Jane’s authentic portrait and tried to bring out the humour and sparkle in Jane’s eyes? Or did she indeed look old before her time, with a scowl on her face, as her portrait shows? We can only imagine Jane with our minds’ eyes and paint our own portrait, using our imagination. Austen-Leigh, J-E. (2002). A Memoir of Jane Austen and Other Family Recollections. Oxford World Classics. Laski, M. (1975). Jane Austen. Thames and Hudson. Nokes, D. (1997). Jane Austen – A Life. UCP. Tomalin, C. (1997). Jane Austen – A Life. Penguin. Thank you, Internet – I have just received a beautiful wall calendar for next year. The Jane Austen Companion to Life is complete with late 19th Century illustrations from Jane Austen novels, quotes from her books, trivia and excerpts from her personal letters. I also love the pretty pastel-coloured design of the calendar. Bring on 2011! Having returned from my UK trip, I suddenly had plenty of Austen-related paraphernalia with me: postcards, brochures, entrance tickets etc. I decided to keep these things and store them in a tiny scrapbook, which I could browse whenever I felt like reminiscing all the fascinating places I visited. I purchased this postcard at the National Portrait Gallery, where I had the chance to see the one and only certain life portrait of Jane Austen, sketched by Cassandra Austen. The portrait was stored in a glass case in Room 18 of the Romantics Gallery, and I was surprised to see how tiny the portrait really was – the postcard is, in fact, larger than the portrait itself! It is a pencil sketch with light colouring on and around the face, appearing somewhat incomplete. On the next page, I stuck two brochure cut-outs of other Austen portraits. The one on the left is a silhouette that was discovered in an early edition of Pride and Prejudice. Behind the silhouette were the words ‘L’aimable Jane’, convincing some that this was indeed a silhouette of Jane Austen. The picture on the right is an engraving of the original portrait by Cassandra Austen – pretty but with a slightly different look on Jane’s face. I purchased this lovely postcard at Jane Austen’s House in Chawton. It displays the various places in Hampshire that Jane lived in and visited. On the next page, I stuck a helpful brochure for a Jane Austen trail in Alton and Chawton, provided by Alton Chamber of Commerce and Industry. I used this as a guide on my trip to Chawton and Alton. The next page has pictures of Hampshire: Steventon Church, which I’m sorry to have missed on my trip, and Chawton. There is also a small introduction to the Jane Austen Exhibition, which I saw at Winchester Cathedral. I like the sentence at the top of the brochure: ‘It is a truth universally acknowledged that a visitor to Hampshire must be in search of an appreciation of Jane Austen’! These pictures are of the various rooms in Jane Austen’s House at Chawton (from the museum brochure) and my entrance ticket to the museum. This rather crumpled-up cut-out from a brochure, which I received at the Jane Austen Centre in Bath, shows the Austen family tree. I bought this crowded, yet informative postcard at the Jane Austen Centre, displaying the different places that Jane Austen stayed in and where the characters of her novels venture out in Bath. The next page is dedicated to Bath, with my entrance tickets to the Georgian House Museum and the Fashion Museum/Assembly Rooms. Jane Austen’s iconic writing desk deserved to have a page of its own. This postcard from the Jane Austen Centre is of a letter sent by Jane Austen to her sister Cassandra – her friend and confidante. Jane sent this letter from Queen Square and in it she describes how pleased she is with their lodgings, as opposed to their earlier rooms at the Paragon. It is amazing, as always, to read her handwriting, which is as stable as print and a piece of art by itself. Finally, the below cut-out from the Jane Austen Centre brochure displays the chronology of Jane Austen’s life, from her parents’ marriage to the posthumous publication of her books. Have you made similar scrapbooks of your trips? Alexander McCall Smith - A Modern-Day Jane Austen?